Synopsis: Meet Vivi and Jonah: A girl and a boy whose love has the power save or destroy them. This book touched my heart, then it pulled it around a little, then it flipped it over and over before returning it to its normal steady rhythm. I guess what I’m trying to describe is the rollercoaster of emotions this book sent me through. When We Collided is a dual narrative telling the story of Vivi and Jonah, two teenagers going through very different personal battles. Jonah has lost his father, his mother has secluded herself from the family and he is helping to keep his family together. Vivi arrives in his life as a kaleidoscope of vivid colour, imagination and happiness. It doesn’t take more than a few pages before their worlds have collided and we are thrown in deep with them. Despite the description of this book focusing on Jonah, this is very much Vivi’s story. I absolutely loved her character and I thought she was extremely well written. We are tentatively drawn into her bipolar disorder with the mention of medication, experiencing her overwhelming highs as well as some of her rages and low moments. We know she has harmed herself in the past because of the mysterious scar that is sporadically mentioned and we know she has escaped to Verona Cove with her mother to get away from something that she did at home. It is not until the last 1/4 of the book that we truly see Vivi’s bipolar disorder take over and the words themselves are confirmed. Vivi’s journey in this book seemed so real to me and I can only praise Emery Lord for her carefully structured narrative. She truly brought Vivi to life and I felt overwhelmingly sad and happy for her at the end of this story. Jonah was also a good character. Coping with grief is a very difficult thing to do and Jonah’s family were used to cleverly reflect the many ways in which humans learn to cope with loss. His mother has secluded herself from her children, too overcome with grief. The three older siblings are trying to take responsibility for the youngest siblings who are afraid that their older brothers and sister have already forgotten about their father. There are some really touching scenes in this book between the siblings and they felt very real. The only thing I didn’t rate in the book was that this was indeed another case of instalove. I personally didn’t feel that the romance was required in this story. I liked the alternating chapters, I liked how the stories collided and at times became one. I just don’t feel that the romance added to what was already a wonderfully emotional story. I would also like to point out that I also don’t think the romance did anything to take away from the story either. I would actually really love to see this book on screen as a movie. I think it had such a great mixture of happy, sad, funny and emotional moments. The characters were all well developed, even the side characters such as Ellie and Felix. I think this would have great potential as a movie and I don’t always feel this way about books. I really thought that Vivi and her bipolar disorder were characterised and written in such a real and truly heartfelt way. It’s obvious that a lot of thought was put into Vivi’s character and that shines through on every page. I actually liked the way that Emery Lord tackled bipolar disorder face on in this book and it was painfully truthful. I’m really glad that I read this and I think Vivi’s side of the story alone is incredibly important as it gives such a real message to readers about the reality of bipolar disorder. This is a wonderful book with fantastic characters and a message that I will remember for a long time. 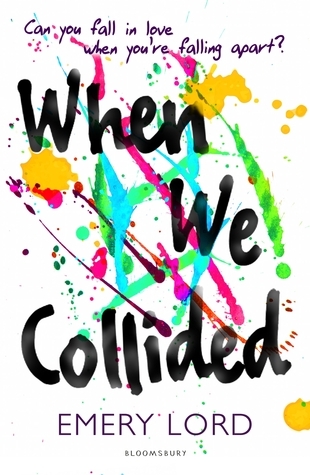 Have you read When We Collided? What did you think? Based on the book description alone, I wouldn’t have imagined Vivi was dealing with bipolar. I am so glad she was realistically characterized! My question is: Is this overall a sad or uplifting book? I read this and wasn’t expecting it to be so focused on mental illness and I liked the characters and the ending. Vivi was fun(even if I did get annoyed at her sometimes but that was the whole part of the story so..) I was really happy with how it ended and I can’t wait to read more Emery Lord books. Same, I didn’t realise that the focus would be on mental illness and I really enjoyed it. I thought Vivi’s character was super interesting and really portrayed the reality of bipolar disorder really well. It’s so obvious that Emery Lord knows what she’s talking about. I’ve not read any others by her either but I’m looking forward to more! Thanks. I don’t think I had either and I really liked this one! All The Bright Places by Jennifer Nevin has a YA romance about kids who are struggling with (intentionally, due to parents ignoring the obvious) undiagnosed mental disorders, including bipolar. It filled me with all the feels!